I've decided to take a break from my Make-Ahead Mondays series for the summer. As much as I love a make-ahead meal, there's just something about summer and desiring nothing but simple, fresh meals. Confession... We have been itching to go on a health kick and after having a few conversations about vegetarianism, juicing, raw foods, etc. with some folks we know, we decided to buy in. We watched the documentary Fat, Sick and Nearly Dead. Great stuff! ...so convincing that we went out and got ourselves a juicer and made the great attempt for a 10 day juice fast. Epic. Fail. We made it for two days but were too drained to continue so I decided to stick with the juicing for breakfast and lunch but make mostly raw vegetarian dinners to supplement. (Sorry, Joe Cross!) It's been a neat change and I think juicing is something I might try for a while. I came across this awesome pin from Two Peas & Their Pod for 20 of their favorite summer salads. I was so inspired looking at their awesome colorful pictures. I had the kale and strawberries so this was my first pick. Pile up your plate with kale. (We found this awesome bag of mixed baby kale at Costco.) 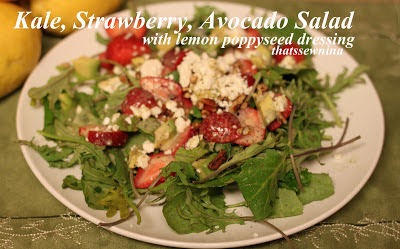 Sprinkle the strawberries, avocado, nuts and feta cheese on top. Sprinkle with a little sea salt and fresh cracked pepper. Drizzle a little more than a tablespoon of dressing over your salad. What a great treat for a quick weeknight dinner! What an awesome salad dressing from fresh ingredients!